It can be a bit unclear what Survey Scout offers, before you join. So is Survey Scout a scam, or can it give you legit ways to earn money on paid surveys? I have joined and tested the site thoroughly myself, and in this Survey Scout review, you will find out what the site exactly offers, and you will also find out why I think the site is mostly a waste of time. But let me show you what it has to offer from the inside, and then you can see for yourself, whether it is a survey site you want to join or not. What is Survey Scout and what does the site offer? 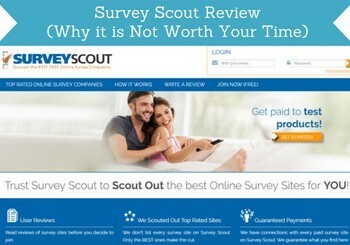 Survey Scout is a bit similar to another site I recently reviewed called SurveyPolice. Both of these sites are not actually paid survey sites as such, but are instead what is called survey aggregators. If you have read my review of SurveyPolice, you will know I think it has a lot of lacks, even though it is legit. The same goes for Survey Scout – however, I find Survey Scout even less worth the time. But let me explain the options it offers, and then you can judge for yourself. When you first come to Survey Scout’s website, it looks more or less like any other paid survey site, if you do not take a closer look. If you look closer at the description and what it offers, you can see that it says, it offers a list of the top rated survey sites. Survey Scout does not as such offer paid surveys. So this means that you will not actually be able to take any surveys on Survey Scout. It has supposedly instead scouted out the best survey sites (that is where the name comes from), and you will get access to this by becoming a member. However, you do not actually have to become a member of Survey Scout to see the list of the survey sites. You can already see them without becoming a member. And it does not give you access to a bigger, list after you become a member. I must say that I in general do not like sites that try to get you to sign up just to give you a list of survey sites – I think it is a waste of time. Also, the list Survey Scout provides is not very long – the exact amount of survey sites you will be recommended depends on the country you live in, but it is in general a very poor list. SurveyScout says on the site that it only gives you a list of the best survey sites – I would argue that this is definitely not true. It gives you a list of the sites, it gets paid to promote to you, and there are many of the absolute top survey sites like Swagbucks and PrizeRebel, it for example does not even mention on the site. So in my opinion it is a very poor and short list you will get access to on Survey Scout. I will however mention that all the survey panels I have seen promoted on Survey Scout are legit survey sites, so it is not promoting any survey scams, which is great to see. Survey Scout also has reviews of the survey sites it recommends. These are user-generated reviews. You can read them without becoming a member, but you have to be a member to be able to leave a review. As a member you can leave reviews on Survey Scout. User-generated reviews can be a good way to see different opinions about survey sites, but it can also give a distorted view, as it is often mostly people with something negative to say that are leaving reviews about survey sites, and survey reviews can also be created falsely to make certain panels look better. I cannot say if anybody has ordered people to post positive reviews on Survey Scout for certain panels, but I can say that compared to how balanced reviews normally are, it is very strange that they are so extremely positive and the average rating is very high. This might of course just be a coincidence or because the sites really are that great. Also, there are not many reviews and the reviews for the different survey sites has been made by many of the same people, meaning that most of the people that have left a review, have done it for several survey sites. So overall you do not really get many different opinions. No matter what, its reviews will not help you much, as there are not new reviews. I have looked through it, and the latest reviews I found as of writing this was from the beginning of 2017. So not really an updated and active site anymore. Each review on Survey Scout has a bit of background information about the opportunity the site has. It is nice that there is a bit of info like this. I however think it is too superficial and does not really give any other info than the facts, you can easily read on the survey sites themselves before joining. I like that it have included some extra info and some facts, it is just not something that gives a lot of value in my opinion. I understand that Survey Scout of course needs to make money somehow, and therefor needs to include promotions on their site. 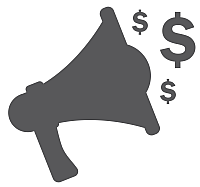 As a website owner I know that it takes a lot of time and effort to keep a website going, so promotions are almost necessary to pay for the costs of running a site. So I have no problem with this. I do however think the promotions are a bit too pushy, as you are sent promotion links already in your first email from them. Usually when joining a survey site, you get an email, where you have to confirm your membership. 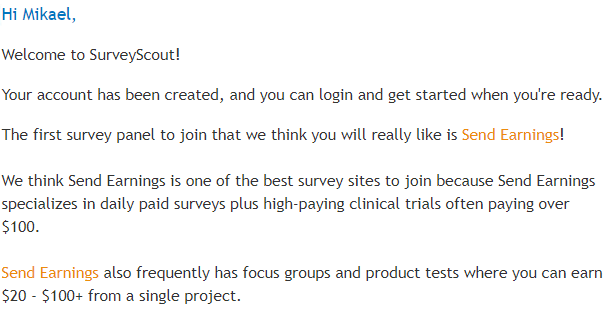 On Survey Scout you also get an email as soon as you sign up, but not to confirm that you actually signed up – instead you receive a welcome email with promotion links in it. My welcome email from Survey Scout was very promotional. In the mail above you can see that I do not even have to confirm my membership, before I received an email pushing an offer with several links, where it will get paid, if I click it and sign up. As mentioned, I have no problem about them using promotion links (I am also sometimes doing this on my website, but always disclose when I use promotional links) – without this it would not be possible to run websites. However, that it sends me an email like this as the very first email and try to oversell a certain site (I know the site, so know it is being oversold) is an example of the main issues I have with Survey Scout – It focuses mainly on promotion and not on really providing helpful and valuable info to its visitors in my opinion. How do you get paid on Survey Scout? As mentioned already, Survey Scout is not as such a survey site. It is a survey aggregator that gives you a list of actually survey sites. So I just wanted to make it clear that this means that you will not get paid on Survey Scout. Once you sign up for Survey Scout, you will just get a list of survey sites, but you still have to go to these survey sites and sign up there. You will then get paid on each of these survey sites, and Survey Scout has nothing to do with the payouts and rewards. Survey Scout does however says it guarantees payments. Survey Scout does not pay you itself. You should not see this as a guarantee that Survey Scout will pay anything, but that it guarantees that it only recommends survey sites that are legit and that actually pay. In my experience it is only recommending legit survey sites, so that is great. You can in theory join Survey Scout not matter where you live. The website does however register which country you live in, when you enter the site, so how many survey sites you are recommended depends on this. However, even from the US, which is one of the countries with the most opportunities when it comes to paid survey, you will get a very short list. Is Survey Scout worth joining? Whether SurveyScout is worth joining or not depends a lot on your preferences. Personally, I think it is a waste of time to join it. They only thing you really get out of joining is that you are able to leave reviews. Only for a very limited amount of survey sites however. You do not have to be a member to access the rest of the info on the site. I do however think the list is too short and poor, and the additional information you can find about each survey site is superficial. If you really want to be able to leave reviews on Survey Scout, it can be worth joining. But to use the site to find the best earning opportunities on paid surveys is in my experience not worth it. Let’s sum up the pros and cons of Survey Scout, so you can get a better overview, before deciding whether to join or not. I appreciate that Survey Scout only recommends legit survey sites. However, that is the only real positive thing I can say about it. I think it is too promotional with too much focus on promotions and not enough focus on the user and on providing quality information. I in general do not like survey aggregators, that just gives you access to a list of survey sites, and create a membership for this, and therefore do not recommend spending too much time on Survey Scout. If you have any comments, questions, or have any experiences with Survey Scout yourself, feel free to leave a comment below. I will be happy to answer any questions and hear about your experiences. Survey Scout is not really a survey site. It just gives you a list of a few survey sites and gives you access to some outdated reviews. It does however only recommend legit survey sites, even though it is a short and poor list. Most of the time survey site either pay too low it is too time-consuming for anyone. We cannot spend hours and get paid for a few bucks. Most of the time these type of platform still work by having more member entering it. This can be considered a scam but you get what told so there is not complain. Still, if the members are there for the quick money then it is good but there are also different places where you could learn skills and make money. One such example is freelancing. My point is if you feel that the money is not enough there are ways to make more money. I agree that Survey Scout is a waste of time. But I do not agree that survey sites as such are a waste of time, if you join the best of the legit sites. People mostly get disappointed, because they expect to be able to make a full-time income on surveys. This is not possible, but it can make some really nice cash on the side. And many people forget that in addition to the nice extra money, surveys are an important way to give feedback to companies, organizations, and governments, so it is also a great way to have your opinion heard. And it is one of the only ways to make money online that is 100% risk free, and where you will start earning from day 1.